Just ‘cause it’s Friday…we could all use something a little upbeat – enter Jay Lavery. 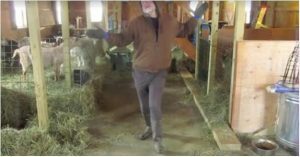 I came across this Huffington Post article complete with a video of Jay demonstrating his dance skills while tending the goats on his farm in upstate New York. It’s dance like nobody’s watching…except for the goats who don’t appear to be judging him (but that’s just a guess since I don’t know how judgmental goats tend to be). I don’t know what’s going on in upstate New York since I just posted yesterday about the whole giraffe giving birth fiasco being live streamed from upstate New York. My goal in life is to own one of those Volkwagen vans and travel around North America with my laptop, a camera and a pile of books. I’m officially putting Jay Lavery on my list of people and places I’d like to encounter along the way. Anyhow, watch the video (click on the link to the article below). It’s a departure from the dark and twisty side…but it’s Friday and I think we could all use a giggle. In ireland and couldn’t stay away!! Love you nasty!!! Next Next post: Coffee Enemas…how do you take your coffee?